Glutamine is an amino acid synthesized in the muscle that plays major roles in protein synthesis, acid-base balance, anabolic processes and is utilized for cellular energy and as a carbon source. It is used in treatment of injury, trauma, burns, and also as a supplement for muscle growth and post-surgery healing. Simple, direct and automation-ready procedures for measuring glutamine concentration are very desirable. BioAssay Systems’ EnzyChrom™ glutamine assay kit is based on hydrolysis of glutamine to glutamate and colorimetric determination of the product. The intensity of the product color, measured at 565 nm, is proportional to the glutamine concentration in the sample. 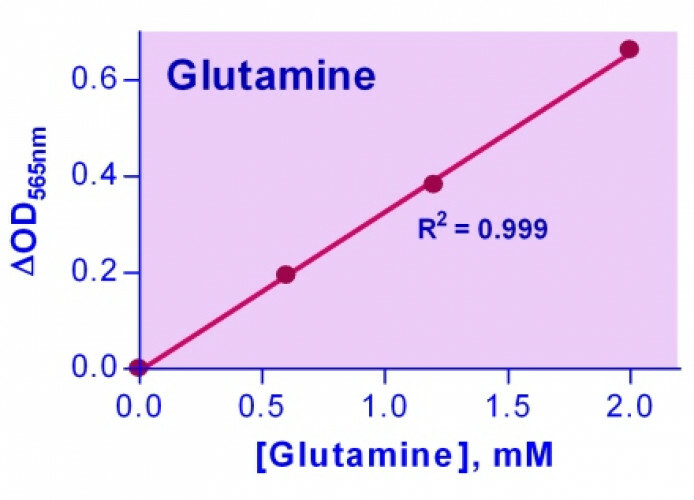 Applications For quantitative determination of glutamine and evaluation of drug effects on glutamine metabolism. References Assay: Glutamine in Hamster CHO cells (Pubmed).